Sometimes you stumble across an artist who has only a couple of comic based pieces, other times there can be just one work so brilliant, you'd risk being stoned to death by fellow art lovers for putting something else beside it. 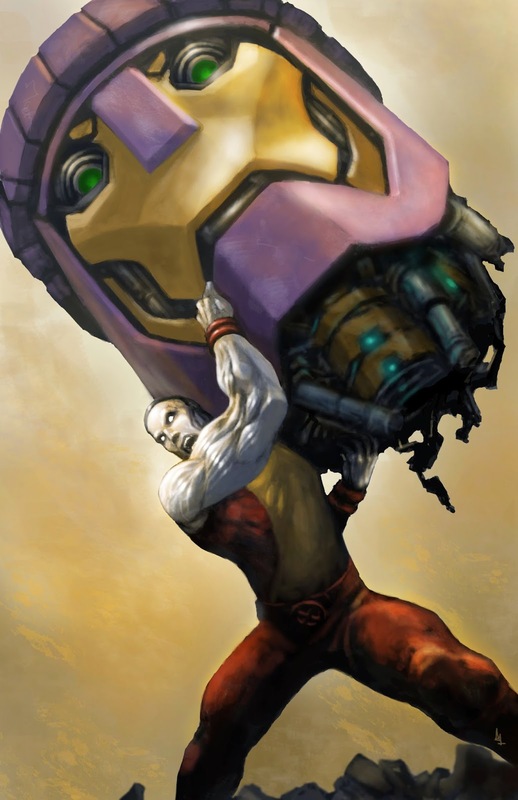 These are Random Works of Wow and illustrating the point this week is Colossus vs Sentinel by Alex Lopez. This is one awesome take on the might of the mutants. I like that not only is ol' Colossus in his traditional red and yellow, but there aren't those rings around his metal body which can come off goofy at times! Alex says he did a metal study to pull this piece off, and by the texture of the sentinels head, and the shine of our hero, it has definitely paid off! His online gallery has other Marvel greats, from Nightcrawler to Hulk, so be sure to pay Lopez a visit. Cheers Karl, glad you liked it mr. Hope you're havin a good weekend up in the northern hemisphere there! Now that truly deserves a WOW! It's so damn professional -looking, you'd swear its from one of those Anime artist studios. Thanks Dale - it does look pretty smooth huh!